WEST LAFAYETTE, Ind. — Most of today's batteries are made up of rare lithium mined from the mountains of South America. If the world depletes this source, then battery production could stagnate. They minimized sodium's exposure to the moisture that would make it combust by making the sodium powder in a glovebox filled with the gas argon. To make the powder, they used an ultrasound – the same tool used for monitoring the development a fetus – to melt sodium chunks into a milky purple liquid. The liquid then cooled into a powder, and was suspended in a hexane solution to evenly disperse the powder particles. 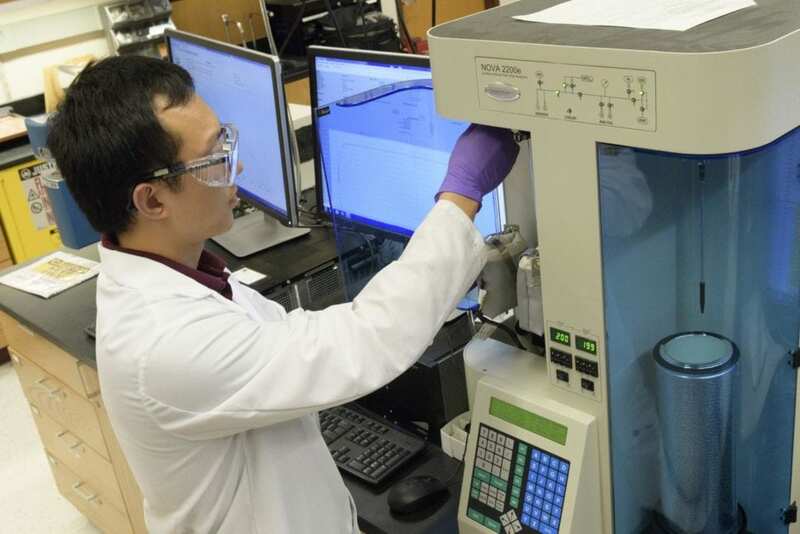 Just a few drops of the sodium suspension onto the anode or cathode electrodes during their fabrication allows a sodium-ion battery cell to charge and discharge with more stability and at higher capacity – the minimum requirements for a functional battery. A provisional U.S. patent has been filed for this technology. The work was supported by the Purdue University Trask Innovation Fund. Excessive solid electrolyte interphase (SEI) buildup in the formation cycles or later cycles consumes electrolyte, depletes alkaline ion availability, and increases cell polarization; the reduction in the amount of available alkaline ions upon cycling often causes low capacity and poor capacity retention in full cells. To compensate the Na loss from SEI formation, we have developed a sodium-powder based pre-sodiation technique that could potentially be applied to both anode and cathode materials with minimal modification to conventional battery making process. The synthesis of sodium powder is accomplished via ultrasonic dispersion of molten sodium metal in mineral oil. When suspended in hexane, the sodium powder can be easily applied onto electrodes as pre-sodiation additive. In the half cell study with glucose derived carbon (GC1100), pre-sodiation decreases the initial open circuit cell potential (?1?V drop) and reduces the first cycle irreversible Coulombic efficiency (from 19.3% to 8%). In the full cell study with GC1100 and NaCrO2, pre-sodiation leads to ?10% improvement in cycling capacity and ?5% increase in energy density. Decreased cell polarization is also observed in pre-sodiated cells.